[The following report came from ARRL Mississippi Section Manager Malcolm Keown, W5XX]. Mississippi has managed to escape the hurricane bullet for three years in a row, but our luck ran out this year. Isaac came ashore on August 28 leaving substantial damage to the power grids in south Mississippi and southeast Louisiana as well as long term flooding. The Mississippi Emergency Management Agency (MEMA) reports that the most damage was experienced in Hancock, Harrison, Jackson, and Pearl River counties with 44 more counties north of the Coast being impacted. The ARES/RACES response was well organized with station KM5EMA on from MEMA, the Delta ARES Emergency Net handling tactical traffic, and the Mississippi Emergency Net handling health/welfare traffic. Thanks to Jim Rapp, WS7EOC, Richard Webb, NF5B, and Douglass Sullivan-Gonzalez, K5DSG, respectively, for managing these operations. In addition, James Ready, N5LRQ activated the two-meter link from Jackson to the Coast, and several SKYWARN nets were activated. Operation from county EOCs was reported from Forrest, Greene, Hancock, Harrison, Hinds, Jackson, Lauderdale, Pearl River, Stone, and Warren counties. Others may have been activated but have not been reported as of this writing. NF5B reported that the Delta Emergency Net operated continuously for 46 hours. Many thanks go to net control stations who manned one or more two hour shifts. Net Manager K5DSG reported that the Mississippi Emergency Net operated for 30 hours. A widespread communications emergency did not develop and there was not much resulting traffic; however, this was an excellent opportunity to test our readiness for catastrophic events in that we had not had an exercise of this magnitude since 2008. Many thanks the DEC's, EC's, AEC's, and ARES members who activated stations as part of the ARES response to Isaac. William Musa, K5YG, advised from the Ocean Springs EOC that the Ocean Springs Command Center asked that an emergency message be passed to authorities in Louisiana regarding two adults and one child that were trapped in an attic as a result of attempting to escape flood waters. This message was passed on the Delta Emergency Net to the Louisiana State EOC. Later in the day word was received that the three people had been rescued along with 15 others rescued as a result of the message originating from the Ocean Springs EOC. From the September 2012 issue of the MCARA Splatter, Harry Samuelson, KB9ZR, reported that the Harrison County EOC was activated on August 28. In response, Harrison County EC Jeff Smith, N9OKV, activated ARES to man the EOC station W5SGL. The ARES team was divided into three shifts to ensure 24 hour coverage. W5SGL operators monitored the HF Nets as well as the local Emergency Net on the Biloxi 146.73 MHz repeater. Many area hams checked into this net and monitored, ready to respond. These hams provided the EOC team with information as to conditions in their respective areas. W5SGL was secured on August 30, 2012. There were over 106 check-ins on two-meters, one emergency message was sent, 136 routine RMS messages sent, and numerous bulletins passed during the activation period. The EOC team used RMS Express for the first time, passing information to MEMA in Jackson, the SHARES Coordinator at DHS in Washington, DC, and ARRL Mississippi Section Manager W5XX via the Internet, VHF, and HF channels. Much was learned about EOC operations/procedures by everyone. EC N9OKV was very pleased with the ARES activation and thanked his team for their support. In Hancock County, the EOC was manned by Thom Kelly, KF7SEB, and Jeff Urbaniak, KF5JTK, the entire time of the event lasting approximately 50 hours. The traffic passed was minimal, mostly local reports of roads flooded. The Hancock County EOC was not located in a permanent location using a building that could be penetrated by RF and the team was unable to find an available opening to run coax for an outside antenna and was forced to use Echolink during the first 36 hours of the operation. After the Internet went down, KF7SEB resumed operations from his vehicle until the MEMA link to Jackson was lost. KF7SEB noted that the activation went as well as could be expected considering the activation was on very short notice and trying to operate from a non-radio friendly structure. He looks forward to working on a solution for future events including plans to have a cross band repeater or a full mobile repeater. From Forrest County, EC Sam Williams, N5SP, reported that he and Lex Mason, KD5XG, DEC Larry Morgan, AG5Z, and Roderick Balam, KF5BLR, went to the EOC prior to the arrival of Isaac to inspect and determine the operational status of the Amateur Radio equipment. It was determined that additional equipment was needed to interface the HF radio to the amplifier. A phone call was made to MFJ and with their assistance an order was placed. Upon arrival, the equipment was installed, which solved the problems. The EOC activated at 1700 on August 28, with Emergency Management District Forrest County ARC station KC5WFM being activated at the same time. The emergency nets were monitored and checked into numerous times. Jasper County EC Albert McDonald, WV1Q, reported that the South Central SKYWARN net and Jasper County ARES Emergency Net were activated due to Isaac affecting the region. Jasper County had power outages countywide and low land flooding in several areas. In addition, there was flooding on Highway 528 in Heidelberg with many roadway blockages from falling trees and heavy rains. And from Central Mississippi SKYWARN, Linda Goodman, KE5PYM, reported that WX5JAN was on the air for 60 hours from the Jackson National Weather Service office. As expected, Hurricane Isaac made landfall in the early morning of August 28 in Louisiana, south of New Orleans as a Category One storm. The Greater New Orleans area and adjacent parishes along with the Mississippi Gulf Coast counties continued to be buffeted by winds and torrential rainfall, causing power outages and flooding. ARES/RACES members were on the Delta Emergency Net and from local and State EOC's and shelters in the affected region. I wish to commend all our Delta Division amateurs involved in these operations for their professionalism and their on the air demeanor. As Isaac moved north through Louisiana and into Arkansas we expected heavy rains, high winds and tornadoes. EOC's were activated in front of the storm through Friday. Power outages posed a potentially big problem in drought stricken areas of Arkansas since the trees were already stressed and the high winds would cause a greater number of trees or larger limbs to fall on power lines. Two Wisconsin ARES/RACES teams in opposite corners of the state had major incidents to deal with this past summer. Milwaukee County ARES/RACES stood up three times, deploying their communications van for the tragic shooting incident in Oak Creek on Sunday, August 5, 2012. And in another corner of the state, the Douglas County ARES/RACES team assisted with communications for their neighbors in Duluth and surrounding counties in Minnesota and northern Wisconsin during the severe flooding in the June 17 to 20 period. The Milwaukee County ARES/RACES communications van staged once and deployed twice in support of public safety agencies for the tragic shooting incident in Oak Creek that sad Sunday. The team owns and operates the van with equipment that is able to link different public safety radio networks together by employing a Raytheon ACU-1000 network cross-connecting device. This force multiplier allows police, fire, and other emergency services with radio systems using different technologies to communicate with each other. That Sunday, the team was alerted on MABAS (Mutual Aid Box Alarm System) with instructions to stage the van, ready to deploy, at the Greenfield Fire Department. Even though most ARES members from Milwaukee and Waukesha County were in Whitewater providing communications support for the MS150 Bike Ride, the team was able to respond with two hams -- James Langer, WI9FF, and David Lofy, KC9TGE -- who were able to get to the van, and get it prepped and ready to roll in just 30 minutes from the time of the initial request from Emergency Management. coming in from Madison, Dane, Racine and other surrounding counties. WI9FF and Phillip Rebensburg, KC9CI, staffed the van and reported to the Oak Creek Police station. High profile officials were coming to attend the Prayer Vigil, including the Governor, a U.S. Senator and Representative to Congress. Brian Jansen, KC9GMW, a Milwaukee County AEC, and lead COML for the State, assisted in setting up a communications plan and the ARES van remained on standby at the Oak Creek Police Station through the entire event. 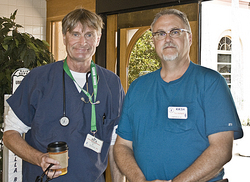 A memorial event was held on Friday, August 10, and again ARES/RACES was involved with van and communications support. The Milwaukee group's van provides tremendous service for multiple public safety agencies and recognition of that fact came by the calls made during this tragedy of violence. In June, Superior, Wisconsin and Duluth, Minnesota roads and bridges were washed out, and five feet of standing water was left in low-lying areas. Water rescues were effected, entire neighborhoods were evacuated, highways were cut off, and Internet and cell service was gone on the North Shore of Minnesota. Members of the Douglas County ARES/RACES team went to work. Douglas Nelson, AA0AW, and Garry Hooghkirk, KD0DHB, organized an effort to staff the Douglas County EOC, provided mutual aid across the border to the St. Louis County EOC and the National Weather Service's Duluth office. It took many hours to get the Lake County, Minnesota EOC open, due to road closures. This team worked with many local radio amateurs to collect information on road closures and damage reports from throughout the area. They also provided the only link to the outside world for Lake and Cook counties in Minnesota, established contacts with Life Flight services for the Grand Marais Hospital, handled traffic for doctor exchanges on the North Shore and provided support for Emergency Management in the region. Upon receiving the news of service restoration for the North Shore, the crews at the EOCs stood down. Many of the members of the Douglas County, Wisconsin ARES/RACES team live right across the border in and around Duluth. The cooperation across state lines is tremendous on both sides of the border. As a regular reader of the ARES E-Letter, I've watched the newsletter consistently espouse the use of D-STAR for disaster response and emergency communications services. 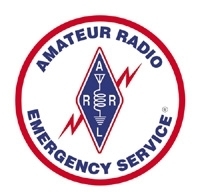 One of the ARRL's catchy slogans, which is really more than just a slogan as it rings true is: "When all else fails, Amateur Radio." Here in the mid-peninsula area south of San Francisco, we regularly train using simplex among hams, relaying as needed, to ensure all exercise participants get the messages. Among other things, these exercises encourage us to put up more effective antennas to ensure we can communicate across our cities on simplex and not rely on the numerous local repeaters. Mesh was brought to the US Virgin Islands about six months ago by Peter Sinkowski, KP2US, and the networking has spread like wildfire. KP2US purchased many units, flashed them and sold complete "starter kits" at cost. It's grown from there with our own reflector facilitating dialog. There are presently about three dozen nodes in the USVI, and more are coming on-line quickly. We found a source for "rootennas" (outdoor router-antenna combinations) and are in the process of building up those for permanent deployment in strategic locations, i.e., attended locations with backup power, particularly at radio amateurs' home sites. We also have a cheap mesh go-kit design using kitty litter/food plastic containers. Inter-island mesh links are high on the agenda. Installation of a 10-mile link between St. Thomas and St. John is slated for the near future. Commercial 2.4 WiFi signals have been copied across the 40-plus mile St. Thomas to St. Croix link and the design of a 2-way link is underway. A demonstration of mesh network capability was given to the local EMA, VI National Guard, TSA, E-911 and VI PD. It was well received and we are moving toward designing systems to provide backup voice/data /video communications at key locations: the EOC, E-911, shelters, points of distribution, airports, and ports. I'd like to congratulate you on an excellent Public Service column in July 2012 QST. I believe it is very important for those involved or contemplating involvement in emergency communications to understand the risks to their mental health as a result of what they may experience. Although one may experience a traumatic event that causes nightmares and/or depression during ARES events, it is also possible to trigger PTSD of traumatic events of many years or decades past. My personal experience and one apparently common to many Vietnam veterans, was PTSD triggered by the events of 9/11. After more than thirty years home and with a successful career in telecommunications and RF applications development for State Farm Mutual, PTSD and depression happened to me post 9/11. Prior to 9/11, I enjoyed the challenge of developing disaster recovery communications procedures for State Farm and being involved with MARS, FEMA, and ARES communications. It took several years of psychiatry and medication post 9/11 to recover. Now, while I will support the local emergency communicators as a technical resource, I can no longer be a communicator or be on-site for training or actual events. At right, Madison County (AL) EC Tim Holland, KK5H, visits with K1CE in Daytona Beach, Florida. EMA. We have open access to the EOC for meetings and exercises." Holland has many county hams and seven AECs to assist him with his active ARES team. A new program in central Florida helps neighbors and communities in times of need, with minimal extra effort, right from our own homes: The Neighborhood HamWatch. NHW is not an organization. There are no tests to take nor structured organization to follow. It is rather a simple service program where every ham has the opportunity to use his/her license and radio skills right where they live to support their neighbors during times of an extended power outage or isolation in a disaster or incident. All an NHW operator needs is his or her radio and an emergency backup battery or generator power supply. Neighbors could be physically isolated due to downed trees, wires, flooded rivers or unsafe roadways. Community life is disrupted, a situation that can last for days or weeks. Residents are under stress from electrical and communication blackout and personal isolation. Media reception is disrupted, telephone and cell phone circuits are overloaded or down and the sense of community is shaken. During these periods of isolation, fear and rumors fill the gap created by a lack of official information and the inability to contact someone outside of the affected area. I agree with you regarding it being time to consider the drafting and development of an ARES QSO Party. In order to promote on-the-air practice of skills of message handling and efficiency and the networking of local, district and Section ARES groups across the country it would need to have local, regional and national components. Regarding your call for ideas for an ARES QSO Party: Don't limit the Party to a traditional HF only contest -- it should be more like Field Day. Although allowing use of repeaters would be desired from an "all ports in a storm" approach, one person could monopolize a repeater. However, allowing ARES repeaters to announce local non-repeater VHF/UHF frequencies being used by ARES QSO party members once an hour would seem prudent. It would also give some attention to this event. If the logistics of this recommendation are too onerous, require anyone who would use VHF/UHF to pre-register with the ARES group. By doing so, they could have input to the ARES group and the ARES group could publish the frequencies used during the VHF/UHF part of the ARES QSO Party. Although Morse code is an important emergency capability mode, care should be taken to allow voice-only ARES members to be able to win. This is traditionally accomplished by keeping awards segregated by mode. If this isn't possible, ensure adequate voice-only awards. As we all know every event has lessons to teach us, whether the event be big or small. Isaac, while not packing the punch of Katrina or Ike, still had a tremendous impact on the Gulf coast. In the aftermath lessons emerged for your staff at HQ. As we've seen in the past, a Major Disaster Emergency Coordinator (MDEC) would have been a huge asset. Hurricanes have a tendency to remind us of this since the operational level rises from the local level to the section level as state assets come into play and typically involve many sections (Isaac involved 13 and Irene in 2011 involved 19 sections). The idea of an MDEC is not new and more information can be found on the ARRL website. Having that go between during multi-section events would be a great tool in the toolbox. We have also seen the value of contest stations during an emergency. When net control stations were needed during Isaac, contesters volunteered their skills and stations to serve. When planning, be sure to reach out to the contest community. These top of the line stations and operators with sharp skills can and want to assist. And finally, the methods we use to get information from the field could use some improvement. Our primary method for receiving updates is via e-mail. The e-mails give us a snap shot of what is happening, but they lack hard numbers. A modernization of our on-line reporting system, for both major disasters and routine ARES activations, may need to be considered. Information from the field is critical: It keeps us aware of Amateur activity, provides us with information to share with national partners, and helps increase our visibility to media and the public. Lessons learned has been a buzz word in disaster response for many years and these lessons are important. However, what matters is lessons applied. I've been amazed at how many times the same lessons learned emerge again and again with each disaster. Lessons applied is how we get prepared for the next one. It shows that we don't suffer from disaster amnesia. Here at HQ we'll work on building from the lessons learned, as we did after Irene and the 2011 Halloween Nor'easter. September is National Preparedness Month. The ARRL Simulated Emergency Test (SET) is October 6-7; yes, that's right, that's just a few weeks from now! Click on the links for more information. Get psyched for SET! It had been a while since I took and passed FEMA's Introduction to the Incident Command System, IS-100.b, so I took it again. To take this course, which is an essential for any ARES operator, click here. And while you're at it, take IS-200 and IS-700, too, on ICS for Single Resources and Initial Action Incidents and the National Incident Management System (NIMS), respectively!